I'm using the latest version on Windows 7/64-bit. I'd like my fences to respect the manually set order of the icons (I have "view" = Icons), so I keep the "order by" option unset. However, upon Windows (or Explorer) restart or even after restoring any snapshots, the icons get reordered as if it was set to "by name", even though the "order by" remains unset. Is there any options I'm missing? You can set the order, just not arrange them away from the group. Thanks for the tip, but I did that step by step, right now, and it didn't work. Once Windows Explorer is reloaded (or upon reboot), the icon (visual) order goes back (visually) to alphabetic order, although the "Order by" remains unchanged and unset. 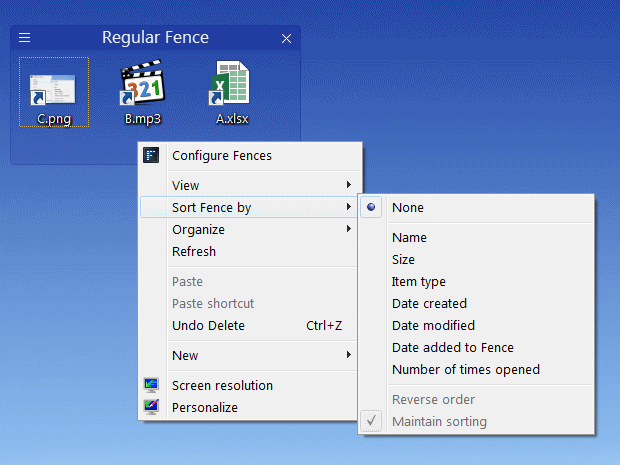 I'm restoring my old Windows environment now (System Restore Point) because, after purging Fences, I lost my Fences personal settings. I hope the developers can fix this order issue soon. It's very annoying to reorder various groups manually several times daily. are your fences a Portal or a regular fence ( not a portal ). Both kinds, and both behave the same. EDITED: actually, a recent test revealed the problem affects portals only. 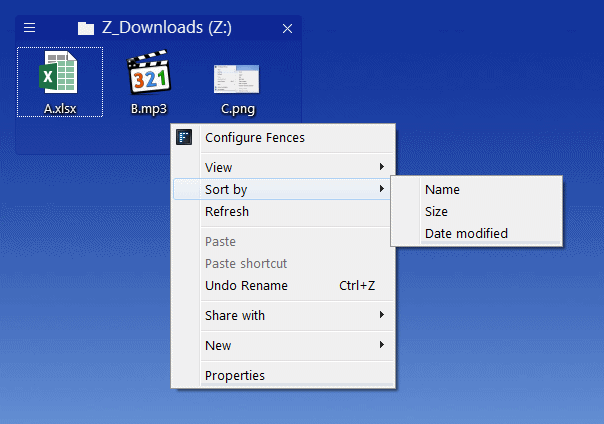 Fences v3.0.9.11 on Windows 7, 64-bit, full Admin rights, English (installation DVD and current System locale), Brazilian Portuguese (metrics and keyboard settings). The issue has always been around, since v2.x series. 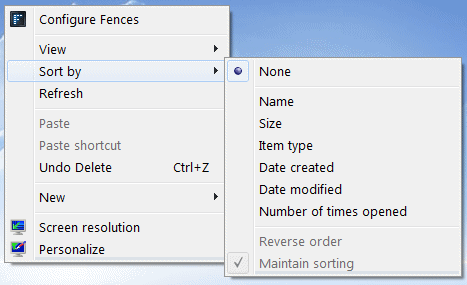 On my Windows 7 system, I can sort manually without a problem. As you can see, on my pc, I can put the icons in any order I want. And it still as it is when I reboot. And I also did tried to save layout . Reboot, load layout with sorting active. Than load saved layout with sorting "none" and It look like this one again. No problem. Just curious when you saved your layout did you make sure you save it to a specific name instead on just date. If it just date, it will probably be overwritten. Just curious when you saved your layout did you make sure you save it to a specific name instead on just date. If it just date, it will probably be overwritten. I use numbers: "1", "2", etc. ALso tried with alphanumeric names, but the result is the same. Could you try to do a video grab of your problem and share it here. Just like the video I added above. Sorry for the lack of the video. It's complicated for me. Anyway, I've just found out the problem affects portals only, not regular fences! See how the portal's contextual menu looks different (not "Sort Fence by" as on regular fences). 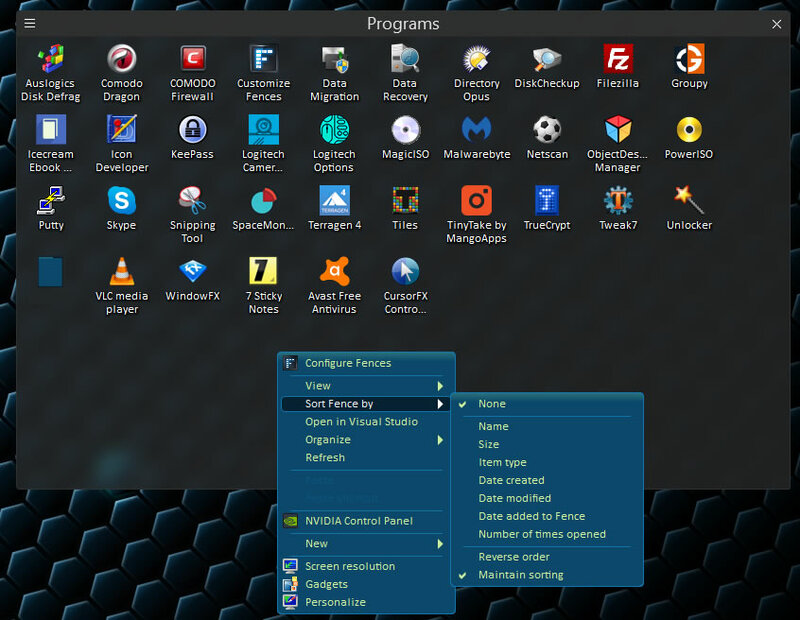 Conclusion: Fences is not taking control over the sort order of icons inside portals.